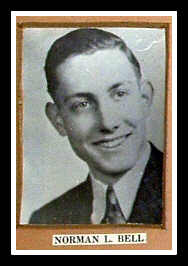 Private Norman R. Bell, USMC, was killed in action on Iwo Jima on Feb. 20, 1945. Pfc. Bell is the son of Mr. & Mrs. Lawrence Bell, Brookline Avenue. He was awarded the Purple Heart, the Presidential Unit Citation with one service star, and the Asiatic-Pacific Theatre Ribbon.